Following yesterday's raids, the State has been unable to show any credible grounds for the serial arrests. Following a petition filed against the arbitrary arrests of five activists yesterday, the Supreme Court has granted them interim relief. All five of them have been remanded to house arrest, while the Court has sent a notice to the Maharashtra government. The petition was filed by Romila Thapar, Prabhat Patnaik, Devaki Jain, Satish Deshpandey and Maja Daruwala. The petitioners prayed for an independent comprehensive inquiry into the arrests as well as an explanation from the Maharashtra government for the arrests. 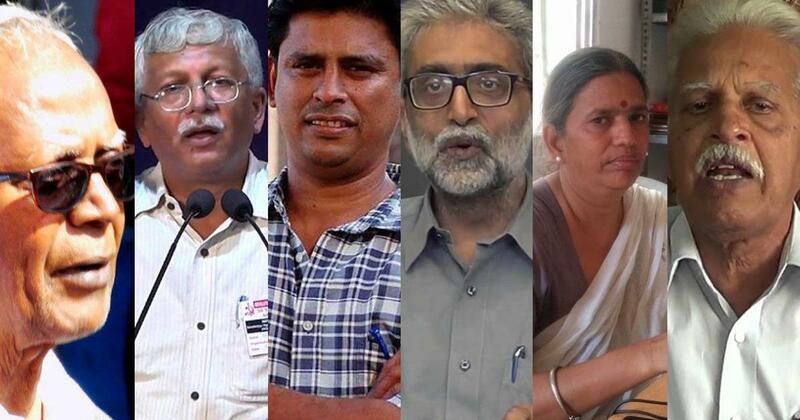 The petitioners also prayed that the Court direct the release of all the activists arrested in connection to the Bhima Koregaon violence, and stay all other arrests until the matter is fully investigated and decided by the Court. The Maharashtra government challenged the petition arguing that strangers cannot file a petition in favour of the activists. However, the jurisprudence concerning write petitions has already expanded the requirement of locus standi. Commenting on the matter, Justice Chandrachud observed that "dissent is the safety valve of democracy". Prior to the petition in the Supreme Court, a habeas corpus petition was filed on behalf of human rights activist Gautam Navlakha in the Delhi High Court, while another had been filed in the Punjab and Haryana High Court on behalf of Sudha Bhardwaj. The respective High Courts had stayed the transit orders in both the petitions yesterday. In the case of Navlakha's habeas corpus petition, the Delhi High Court had directed that translated copies of all the documents relating to his arrest be presented before the Court at 10:30 in the Morning today. However, at the time of the hearing, the arresting officers had not completed the translations from Marathi to Hindi. Hence, the Court postponed the matter to 2:15 the same day. At 2:15, the Counsel for the petitioner, Nitya Ramakrishnan was in another hearing. The Court then allotted 2:45 for hearing the petition. However, despite two adjournments, only the First Information Report and the CM memo had been translated, whereas the arrest memo had not been translated. The counsel for the petitioner, Nitya Ramakrishnan, questioned the legality of the arrest, stating that if the contents of the documents are in Marathi, how can a non-Marathi speaker even know the grounds for their arrest? She further questioned whether the police were even wearing identifiable uniforms when they effected the arrest. The Court then told the prosecution that they cannot presume that the metropolitan magistrate can read Marathi. Responding to this, the public prosecutor, Aman Lekhi, began narrating the chain of events leading to the arrest, stating that the grounds for arrest had been translated into Hindi for Navlakha. However, the Court interjected and berated the public prosecutor for the delay in translating the documents. The Court questioned legality of the transit order from the metropolitan magistrate, since all the documents at the time were in Marathi. The Public Prosecutor then informed the Court that they had interacted with the magistrate for 10-15 minutes, and appraised him of the grounds for the arrest, after which the transit order was granted. The Court then referred to the first line of the translated FIR which mentioned the Elgaar Parishad event on December 31 last year, observing that Navlakha was not even present. The Court questioned whether the magistrate had granted the transit order on the basis of one line. The Court observed that even if the other arrests are valid, one cannot assume that the present arrest was too without seeing the proper documents. Now that the Supreme Court has granted a broad interim relief to all the detained activists, the High Court possibly will not be able to pass any further Orders on the matter. The petition in the Supreme Court has been listed for September 6.